Depending on the purpose of your travel to Germany, there are different types of visas that will apply to the occasion. Whether you are planning to go on a visit, study, business or work and reside in Germany permanently, you will have to apply for a different Germany Visa, accordingly. 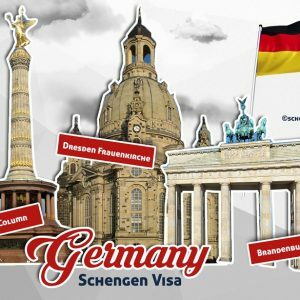 You can apply for the German Schengen Visa since 1995 when Germany as an EU Member State also became a member state of the Schengen Area. Stat: As per 2017, Germany has issued a total of 1,857,770 uniform Schengen visas from 2,049,055 visa applications received at German consulates and embassies around the world. The Visa rejection rate was 7.63%. What documents are needed for a German Schengen visa application? Download the application form, fill it completely and with sincerity. You can also fill the Schengen Visa application form electronically and then print a hard-copy. 2 photos must be attached; the photo should be of passport format – a recent whole-face capture with a light background. Learn more about photo requirements and specifications. Travel health insurance confirmation of minimum 30,000 € coverage within Germany and the entire Schengen area. Hotel Booking for the whole duration of the intended stay in Germany. Find and Book Cheap Hotels in Germany! Means of subsistence – Proof of sufficient financial means for the period of stay. According to the European Commission information, a foreign applicant applying for a German Visa, must be able to attest possessing 45€/day to the German Embassy or Consulate for the period of stay in German territory. Apart from the general documentation required, accompanying should be other additional documents depending on the purpose of your German Visa application. *Note: When applying at the German embassy/consulate in home country, the guardian or parent should accompany their under-age children. Do you need to Extend your Germany Short-stay Visa? Find out in what circumstances and what are the conditions you must fulfill in order to be eligible to Extend your Germany Short-stay Visa. Attention! Please consult with the Germany Embassy in your country for the updated Germany Visa requirements! If you want to stay in Germany for more than 3 months, then you have to apply for a “Long stay visa” also known as a “D-Visa”. For more information about Germany long stay visas, please go to Germany Visa website. Persons with a mandatory visa requirement to enter the Schengen area must take out statutory or private health insurance if they plan to reside in Germany. Health insurance regulations are very different for students, guest workers and immigrants. Health insurance in Germany (by Krankenkassen-Zentrale) explains different scenarios for people entering the country.